The Bulla school precinct comprises the primary school and attached residence, a State School Endowment pine plantation on an adjoining parcel of land, and a suspension footbridge (1872) over the nearby Deep Creek. 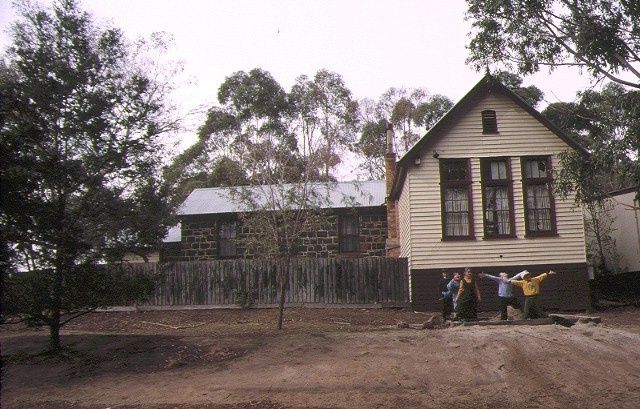 Former Bulla State School No.46 was erected as a government-funded Common School in 1870-71 and transferred to the State School system following passage of the 1873 Education Act. Operating for 125 years, it has a long connection with the history and development of the rural township of Bulla. The school consists of a rectangular-shaped schoolroom and an attached three-roomed teacher's residence constructed of even coursed bluestone. The one-roomed bluestone schoolroom has a gable roof, double-hung, multi-paned sash windows, closed-up fireplace, and a bluestone entry porch that is shared with the attached teacher's residence. A timber bedroom and wash-house were added to the residence in 1927. An additional weatherboard classroom, built in 1881 and extended in 1927, abuts the original schoolhouse; this includes a coved and lined ceiling. The school pine plantation was established in 1929, through the Victorian Government's State School Forest Endowment Plantation Scheme, which was commenced in 1923, and was particularly encouraged at rural and semi-rural schools. The plantation demonstrates the elevated role of forestry education in the state school curriculum in the 1920s and 1930s. As well as engendering an understanding of the conservation and uses of timber, the scheme taught self-sufficiency and self-reliance owing to the self-regulation of the school plantation and the school's control over the revenue from felled timber. In 1950 the Bulla plantation won an award for 'Most Improved School Garden and Grounds' from the Australian Natives Association. The survival of mature pine trees from this plantation provides a strong visual coherence to the precinct. The precinct that comprises the former Bulla State School No. 46, adjacent school pine plantation and suspension footbridge, is of historical, architectural and scientific (technological) significance to the State of Victoria. Former Bulla State School No. 46 is architecturally significant as a substantially intact example of a nineteenth-century bluestone and attached timber school building erected by the Board of Education (and its successor the Education Department), which served the dual functions of schoolhouse and teacher's residence. 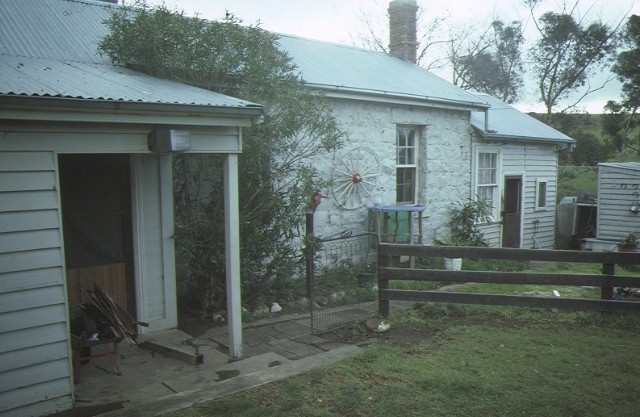 The former Bulla state school is the only known bluestone example of this type. 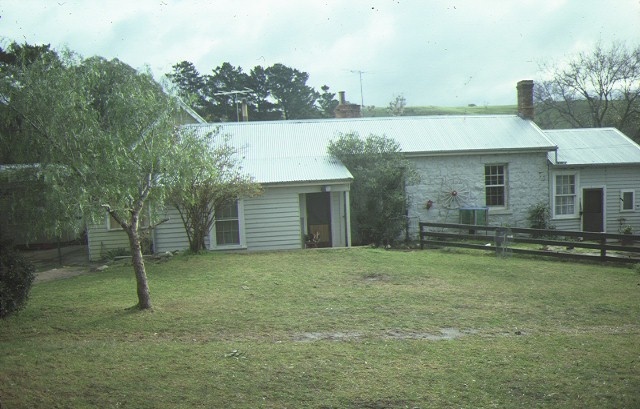 Former Bulla State School is historically significant at a State level for its continuing function as a small rural school for a period of over 125 years. The narrow suspension or catenary bridge over the nearby Deep Creek is of technical significance as representing a typical bridge design of the late-nineteenth century, as well as a common bridge design for school purposes. It is now a rare example of this type and one of the oldest surviving footbridges in Victoria; the only other surviving footbridge associated with a school is at Myrtle Creek. The bridge is also of historical significance for its long association with the school and as an important contributory element of the broader Bulla state school heritage precinct. The adjacent pine plantation, established through the State School Forest Endowment, Plantation Scheme, is of historical significance for its practical demonstration of the values of environmental and scientific learning, which were promoted in the Victorian state school curriculum in the 1920s. Former State School No. 46, School Lane, Bulla. 'The Bulla Primary School established an endowment pine plantation in 1929. The mature trees are located at the rear of the existing school. The School Plantation Endowment Scheme was an initiative of the Director of Education, Frank Tate. A Forestry Branch of the Education Department was formed in 1923 and the first schools to participate included Porepunkah Primary School, Creswick Primary , Castlemaine High School and Ballarat High School. Some schools did not set up formal plantations but planted trees in portions of the school grounds. The involvement of schools in forestry was an important step in the formation of the Australian environmental movement. The aim of forestry education was to educate children on the value of trees in the economy and in the care of the land. It was pointed out by the proponents of forestry education that wood was used in the manufacture of buildings, furniture, fencing, newspapers, as a fuel and in the shipping and mining industries. Trees were recognised as important in water-supply, irrigation, the prevention of floods, and soil erosion, and in providing shade and shelter. The practical process of establishing a plantation was in itself educative. Land was secured by schools through the reservation of areas by the Lands Department. Waste land unsuitable for agricultural purposes such as former mining areas was made available. The first step was to fence the area, with wire-netting fences to keep out rabbits in some areas. Trees were raised from seed provided by the Forests Commission nurseries and cared for by the children at the school. Pines were most often planted, but eucalypts and wattle were also suggested. When the seedlings were ready for sowing in June or July each year, the boys ( and occasionally girls) prepared the ground and planted the seedlings. It was suggested that an area of not more than 50 acres was suitable, to be planted at the rate of two acres each year. When harvested, the plantations provided funds to be used for the school. The idea proved a popular one. By 1930 there were over 241 plantations in Victoria. By 1972 there were 638 plantations in which 702 schools participated and the total net return from the sale of trees had reached $377, 784. While initially schools participating raised money for school amenities, some schools chose to plant non-commercial types of trees to provide shelter and food for birds and animals. David Moloney and Vicki Johnston. Bulla Heritage Study, 1997. National Trust of Australia (Vic.). Timber Bridges Study. State Library of Victoria. Pictoria online database of images. W.W. Gay. School Forestry.Government Printer, Melbourne 1925. (Victoria. Education Department. Circular of Information J New Series).